What is a poor anatomist to do? Twenty pounds, wasted, up in smoke when a beautiful young woman wakes up on the dissection table. Someone has made a ghastly error. Dr Richard Craven, an ethical doctor, has but one choice, to nurse the girl back to health and restore her to her family. That’s when his troubles start. She can’t remember anything, only her first name, and she isn’t even sure about that. As his household helps her to recover her strength and her memories trickle, then flood back, their mutual attraction buds into a flowing passion. Unfortunately one of the things she’s conveniently forgotten was her arranged engagement to a vulgar, but wealthy son of a Northern industrialist. Not only that, but there is some deep dark secret about Dr Craven that her father believes makes him completely ineligible. Resolving the resulting tangle in this sweet historical romance takes the combined efforts of the doctor’s once profligate brother, the Earl of Craven, a displaced French Royal, le Duc de Bourbon, and the visit of a mysterious French Baron to the sacred floor or Almack’s. The vicar intoned the familiar words from the Book of Common Prayer while the family mourned their loss. She died quickly, almost overnight, and now being placed in the family crypt. FORASMUCH as it hath pleased Almighty God of his great mercy to take unto himself the soul of our dear sister here departed, we therefore commit her body to the ground; earth to earth, ashes to ashes, dust to dust; in sure and certain hope of the Resurrection to eternal life, through our Lord Jesus Christ; who shall change our vile body, that it may be like unto his glorious body, according to the mighty working, whereby he is able to subdue all things to himself. That night, the four resurrection men met the verger in the dark churchyard. They carried shaded lanterns and intended to retrieve the ‘vile body’ before it became too vile for their client to use. They wore scarves over their faces to mask their identity. Grave robbing, while technically just a misdemeanour, was a serious offense so they made sure to leave nothing to chance. Still, the money they earned was good, and the likelihood that they would be caught was small. “I thought I’d heard noises.” They all listened and other than the distant “goo-de-who” of an owl it was quiet. Elias led them to the newest coffin. There hadn’t been time to etch a metal plaque for its occupant. A temporary paper label attached to the top said, Cecelia Jane Garth 1790-1810. Resting in Peace with the Lord. Elias stood at the door to the crypt and kept watch while the resurrection men pulled the coffin off its shelf and lowered it to the floor. They opened it and gazed at the contents. The four resurrection men stretched her body on the hard ground of the crypt. It was wrapped in a winding sheet for burial, with ties to bind her legs and arms together. A bandage around her head held her mouth shut. Then they put rocks in the casket, resealed it, and replaced it in the crypt. In the process, the paper label ended up on the inside of the casket. Then they carried her out of the crypt and into the dark churchyard. The gate creaked again as Elias shut it. There was a faint gasp at the same time as he turned the key in the lock. “Did you hear that, Da?” the youngest resurrection man asked, shocked at the noise. Together they carried the body to a waiting cart. It was tied to the kissing gate at the church, and the sorry looking excuse for a horse waited patiently to take up his labours. Since the body had been a beautiful young woman, they carefully laid it in the back. They pulled a blanket over it and then covered that with straw. It wasn’t often they encountered the watch, but it was just as well to be prepared. They hopped onto the cart, and Jonas held the horse. They clumped off into the night at the fastest pace the horse could manage. Elias pulled the four crowns from his pocket and carefully examined them. The pound they summed to, equivalent to almost half a month’s work was a welcome addition to his meagre wages. He said, “Just hope I don’t get caught,” to the wind that was whistling in from the dark of the night. He pulled the gate to the graveyard shut with a loud creak, then latched and locked it. The noise seemed to echo forever in the distance so he listened for the footsteps that would presage a hue and cry. All he heard was that bloody owl. “No, but it’s a fine and prison if we’re caught.” While not technically a death sentence, a long stay in prison wasn’t exactly good for the health. Scanty, poor quality food and the lack of light or ventilation in a crowded building tended to eliminate prison overcrowding. An hour later, Jonas pulled the wagon up in front of the old tithing barn in Streatham and tied it to a hitching post. An ancient building left over from the dissolution of the Abbey under King Henry; the barn was a massive stone building with high narrow windows that discouraged the curious. The tall arched roof still kept the rain out, at least most of it. While it was far enough from the centre of the village to avoid prying eyes, it was also slowly falling into disrepair. Dr. Richard Craven used it for his private laboratory. “Ten pounds. 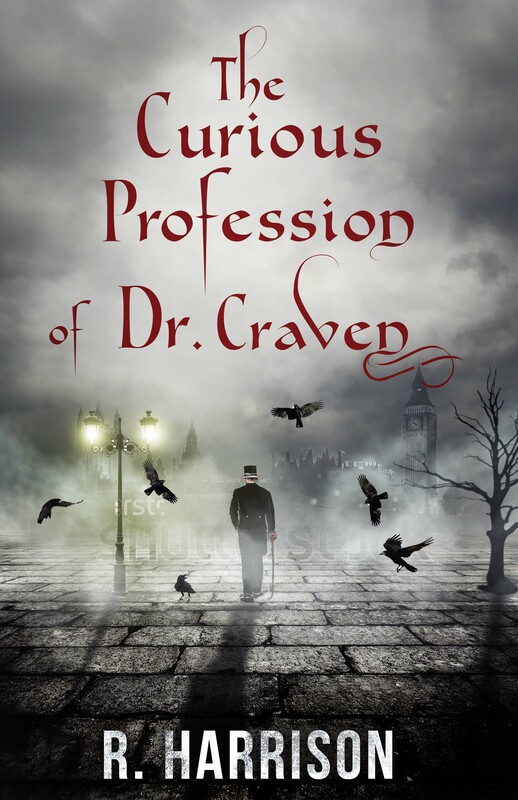 I have it here.” Dr. Craven pulled a note from his coat pocket. “Twenty or we take her straight back.” Twenty pounds was almost a year’s wages for a skilled labourer. Dr. Craven was in no place to argue. He needed a woman to continue his studies, and there she was almost close enough to touch. She was just another cadaver, on her way to returning to the common clay. “Twenty it is, you rogue.” He handed Jonas two banknotes. Together they laid her out on the cold stone floor. Then he walked to the far end of the barn where he kept a small store of run French brandy. Jonas, a man with a nose for the spirits that was only matched by his capacity for imbibing them, followed him. The dark shadows hid the debris of the doctor’s studies, the prepared examples, the bottles of preserved organs, and the strange retorts of his research from their view. A chorus of squeaking rats from the cages at the far end of the building only added to the atmosphere. What little Jonas could see through the flickering candlelight was disturbing enough, even for a hardened resurrection man. In the meantime, the boy undid the bandage that held the woman’s jaw shut tight. As he pulled it off her, her mouth opened and she gasped for air. Jonas and the doctor walked back to him, carrying a decanter of the brandy with them. The resurrection men lifted the body from the floor and put it on the examining table. It having once been a delicate young female, they were gentler with it than they were usually. The doctor gave his hands a quick rinse. Something he did more for superstition than any rational basis, and then he proceeded to examine the body. “She is warmer than I’d expect. The decomposition must be advancing rapidly. I’ll need that ice.” He paused. It, no not it, she breathed. It was a gasp, a weak one at that, but a breath. Between the warmth, the brandy, and the commotion, the woman’s eyes suddenly opened, and she sat up. She saw this handsome dark-haired man looking at her. His concern for her was evident in his face. “Close enough.” Then she lay back and closed her eyes again.